Today is the day! 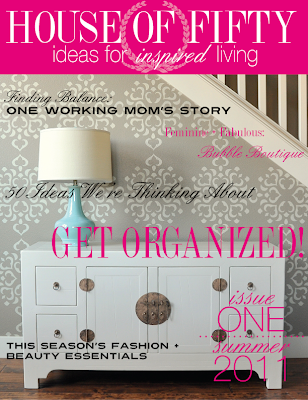 The official launch of House of Fifty e-zine! Created by the very talented Janell of Isabella and Max rooms! e-zine. As a contributor, I was lucky enough to see a sneak peak of the magazine last week...and I must tell you...it is simply stunning. A must read, if I do say so myself. Click here (or on the photo above) to read House of Fifty! Now for a little Easter What-We-Wore. I just love Easter! It is seriously one of my favorite holidays. And one of the things that I love the most is dressing my children up for church in their new Easter finery! 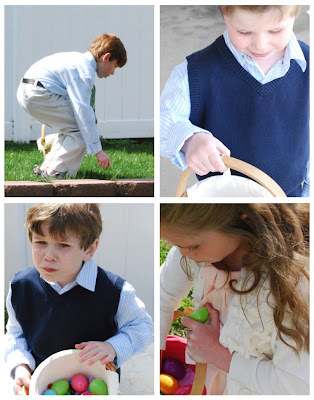 Our family tradition of getting new Easter clothes is one that dates back to my childhood...and one that I've loved continuing with my own kids. Here are the kiddos hunting for Easter eggs on Easter morning. They found them all in no time flat. I wish I had timed them... but seriously, it could not have taken them more than about 5 or 6 minutes. You should have seem them go! And here they are with the goods! Too cute for words, those kiddos. 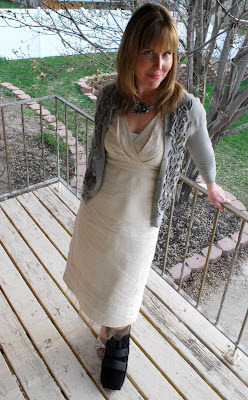 On the Princess: Lady Jane Dress and Mini Frosted Flowers cardigan from DownEast Basics. Bet you're jealous of my awesome footwear, huh? Last Wednesday I was just minding my own business walking down our stairs when "POP!" something popped in my ankle...and boy did it hurt. But the pain went away and I soon forgot about it. Until I was trying to reach something on a shelf and stood on my tip toes. Then "POP!" it happened again. And then again later...and then again...and then on Thursday the frequency increased until I told the hubby I thought maybe I should go get it checked. Turns out I have a small fracture on my right ankle bone most likely a stress fracture that finally "popped" on my way down the stairs last Wednesday. Seeing as it was Thursday night at Urgent Care, however, they just immobilized it for me. I'm going to have to see a specialist this week to find out the details. Let's keep our fingers crossed no surgery is involved. Shall we? But aside from my little escapade with my ankle, it was a perfectly lovely weekend. 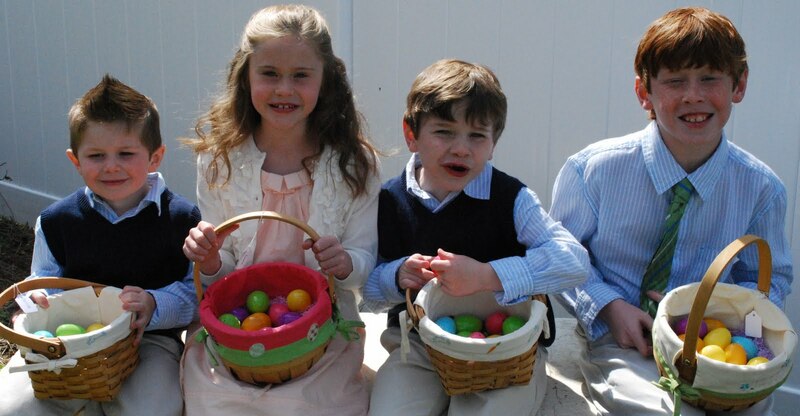 You and the kiddos look Easter perfect! House of Fifty is wonderful! Love it!! Thank you for sharing. what beautiful looking children. mine were all clean and dandy too until they opened their easter eggs! Beautiful post, so sorry about your ankle. I'm so sorry it's been a while since I stopped by for a visit. I always enjoy my time at your lovely blog. Big Hugs! Fashionable footwear and all, you whole family looked fabulous! loved your piece in H of F! thanks for the shout out! And I agree with Janell, you still looked fabulous! Your poor foot! :( You still look beautiful :) Happy Easter! Wendy, I took one look at that picture and went "WHAT? How did I miss what happened to her foot??" We have the same dress. You look hotter in it, though. Take my word for it. You all look fabulous. I love your dress and sweater. Too bad about the footwear....my hubby is in the same boat, fractured a heel while skiing and has to wear an air boot. Fun stuff :) Hope you heal quickly and it is a minor injury! Well, all Urgent Care footwear aside, everyone looks so dashing and darling! I LOVE your cardigan!! It's LOVELY! As an avid magazine junkie, I'm always excited to find e-zines and can't wait to check this one out. YAY! House of Fifty is amazing! Just sent a note to all of my FB fans about it. LOVE! Congrats on the feature! !